After years of observation of trends, and some help from staff with the analysis of aggregate data, I would now like to propose some simple mechanical measures like these to help guide askers into asking better questions. The exact texts and links would be decided if and when the community at large decides we should go ahead with either or both of my concrete proposals below. These two restrictions would only affect questions newly asked or edited. The first is that I would like to ban from titles the two strings “grammatically correct” and “correct grammar”. If someone attempts to use these in a title, they would get a pop-up notification. The reasoning is that these are nearly always yes/no proofreading questions without any research that draw poor answers at best and which are usually closed. The notification text is something we’d work on. It needs to be short to be effective, but we can include links to longer pieces for further guidance and examples of good and bad titles. Most questions that use the grammar tag should not do so. That’s because they usually have nothing to do with grammar at all. People use the tag as a general catch-all equivalent of “language”, a tag which we already ban. If someone tries to use the grammar tag, we can have a pop-up notification explain that they should instead use syntax or morphology or grammaticality if it’s really about grammar. We could also mention non-grammar tags like orthography, punctuation, or capitalization. This notification would also trigger on the grammer tag, as that is a current synonym of the existing grammar tag. We current have ~8.5k questions tagged grammar, which shows you just what a “garbage” tag it really is! Those existing questions wouldn’t be affected by this until and unless they should be edited, at which point the ban would force the editor to choose something more suitable. Is this a great idea, a good idea, a so-so idea, or a lousy idea? To change our site rules this way requires the collective will of the community at large. I’d like you folks to please discuss these two proposals below, whether pro or con. Plus now that you know what sorts of things are possible, you might even have your own, better ideas about such things you might put forward as suggestions. Finally, if we don’t like how it works out, we can of course always turn it off again easily enough: we could run these on a trial basis if we cared to. Yes, yes, yes: just do it already! The suggested title ban would definitely be a good thing: it places a hurdle on blindly asking proof-reading questions, and might cause posters to think about which part of their text they are actually asking about. My SEDE query shows 3341 questions (at present) where the grammar tag has been removed, and that does not include questions which have been deleted. That's a strike rate of around 4% of all non-deleted questions, and that's only those where someone has been bothered to edit the tags. Currently there are 8500 questions which have the tag, and I really doubt whether any of them are actually about grammar: that's around 10% of questions which is probably wrongly tagged with a tag their askers don't actually know the meaning of. This tag is for questions about morphology and syntax, the two elements of grammar. DO NOT USE THIS TAG IF YOUR QUESTION IS ABOUT WHETHER SOMETHING SPECIFIC IS GRAMMATICAL. For such cases use the 'grammaticality' tag. Also do not use this for punctuation or spelling (orthography); those are not about grammar, and they have their own tags. 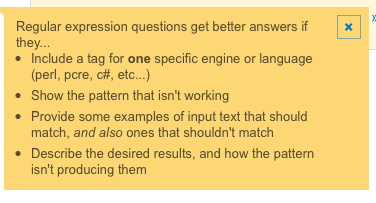 So, YES: prevent the grammar tag being used, and prevent poor question titles being used too. Disallowing “grammatically correct” and such would only make it harder to spot the questions that are off topic; they'd just put an even crappier title consisting of gibberish if necessary. I'm all for pop-ups (can't believe I just said that...) but I don't like the words blacklist and ban. This is too much in one basket; should be like three separate metas. Several metas should decide what is to be 'banned', and another should ask for feature requests to facilitate that, if necessary. Also, if you get rid of the grammar tag, how am I supposed to ignore it still? Arbitrarily banning the most succinct word this site could ever have, -1. By all means. But I doubt whether it will have much effect. I personally think we need AI to detect a subset of off-topic questions, and will be proposing that. I agree with Andrew Leach's post for the most-part, and would like to add that I believe the word is much more polysemous than most of us give it credit for being so it is confusing as a tag. You will be hard pressed to find a dictionary which includes only the syntax and morphology definition, and even if we were to insist upon it, since it is marked for linguistics, Oxford Living Dictionaries and Collins both admit phonology and semantics into the list as well. This is to say nothing of the other older definitions of the word still in use. As a tag, it is confusing and does not serve its purpose of limiting search results to what people want to find. However personally speaking, I think we should allow it in titles. Why do I think this? For one thing, it serves us little to no benefit to remove it. I genuinely doubt it causes much confusion in any given context. If we really must do it in some cases, it is easy for us to edit it out of titles. There are even more people who have the privilege to edit answers unilaterally than those who have the privilege to give a vote towards closure. Moreover, if the word truly is superfluous, it does not change the meaning of the post to remove it. However, we lose several benefits from excluding the word from titles. One is that we are making it harder for people to name their questions, and I fear that perhaps somebody will drop their question entirely on the sole basis that they are frustrated with being unable to figure out an even better name for it, which is something we, as a collective whole, can often do with ease. If one of these questions happens to be any good, I think that is one too many questions to lose for such a minor reason. Whatever benefit we get, if any, is infinitesimally small in my opinion. More importantly though, much like duplicate questions, this word functions as a search term, and can serve as an entry point for new users to find English Language & Usage through search engines like Google. Now it is granted that we do not have too much difficulty with this already, but a little extra help never hurts. These might not be such great reasons to keep the word in the title either, but I deign them to be greater reasons than whatever reasons we may have for banning the title, unless there is something I am missing. What about having a 'Gatekeeper'? Highlighted number of unread messages; could it update and remain highlighted? Is there any difference between the tags “grammaticality” and “grammatically”?